I’ll show you why I like WordRake using an article I wrote years ago, well before I learned of WordRake or StyleWriter. The article was in praise of the Palm Pre, a potential challenger to other smartphones (that was ineptly handled and shut down… but I won’t grumble about that here). WordRake zips through the document, sentence by sentence. 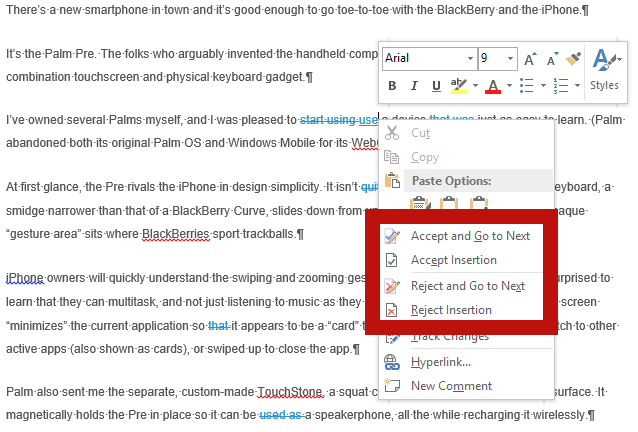 Whenever it finds wording you might want to sharpen, it marks the section using Word’s Track Changes feature. Once the scan is done, WordRake returns you to the beginning of the document and the first words it marked for change. Right-click those words and the typical menu appears – with four extra options. 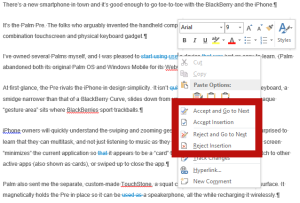 WordRake adds four options to Word’s context-sensitive (right-click) menu. In this case, I can replace two words (“start using”) with one (“use”) so I’ll click the convenient option “Accept and Go to Next.” Helping writers quickly navigate to the next thing they need to fix is a thoughtful touch. This is the basic idea behind WordRake. I love the fact that it flags overused cotton candy modifiers like “very,” “quite,” “indeed” and “actually.” Once you eliminate these, you’re left with writing consisting mainly of “meaty” words that take readers to your point more quickly. As I continue to use WordRake on the things I write, I find that I commit fewer of the types of errors WordRake points out. The “Reject” options matter since WordRake doesn’t always pick up on the nuances of a sentence. Also, to quote from the review I wrote, both pieces of software “will teach you to write in a clear, concise and readable style — but if you write crap, … (they) will teach you to write clear, concise readable crap.” In short, neither tool can replace the services of good editors or writers. My one criticism isn’t directed at the software. It’s for Microsoft, which ought to support the same third-party ribbons in both the Windows and Mac versions of Office software. Put another way: a developer creates one ribbon and it ought to be usable in both Windows and Mac versions of Office software. Otherwise, it costs more to develop and support these tools. Writers of all kinds can use these simple tools to clarify and tighten their prose (presuming that the writers know what clear and tight prose can look like, and they value such prose). Whether writers also use human editors depends on how important it is for their prose to impress readers. Human editors will always have the edge, but writers create less work for editors using tools like WordRake and StyleWriter. If you pay an editor by the hour, these plugins soon pay for themselves.